In the fall, Baylor enrolled the most diverse student body in the University's 168-year history and set another overall enrollment record, according to the Office of Institutional Research and Testing. 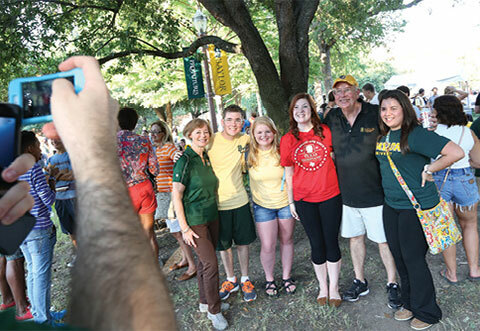 The fall enrollment report also shows fall-to-fall retention for last year's class of Baylor freshmen at its highest point ever. The entering class averaged 1228 on the SAT and 26.8 on the ACT. Diversity among first-year students remains strong with minority enrollment among Baylor's freshman class at 34.3 percent, up from 34 percent in fall 2012 and 32.5 percent in 2011. Out-of-state freshman enrollment increased from 26 percent in 2012 to 29.3 percent in fall 2013. Baylor increased its enrollment among male freshman students, up to 42 percent in 2013 from 38.8 percent in fall 2012. In addition, the IRT report showed that the retention rate among Baylor's first-time freshmen from fall 2012 to fall 2013 increased again to a record 88.2 percent, up from 86.6 percent in 2012, 85.4 percent in 2011 and 81.9 percent in 2010. "It is very unusual for a university of Baylor's size to make such significant gains from year to year in freshman retention rates," said Dr. Sinda K. Vanderpool, assistant vice provost for academic enrollment management. "We have been able to make this progress because the faculty and staff campus-wide believe that every Baylor student can successfully graduate." Vanderpool attributes the continued increases in Baylor's fall-to-fall retention rate to several factors, including the recruitment of outstanding students from around the country, the deep involvement of faculty in the recruitment process and additional funding for merit scholarships. The University also added MAP-Works, a new student success platform that has allowed Baylor to "intervene more proactively and intentionally with students who need the most support," Vanderpool said.